Two-tailed swallowtail butterfly (Papilio multicaudata) feeding on snapdragon and larkspur; photo © Scott Nelson / BugGuide.net (all rights reserved; used by permission). A large butterfly (wingspan 3.5 to 5.5 inches), the two-tailed swallowtail is found only west of the Mississippi in North America (in canyons, foothills, valleys, woodlands, and gardens from southwestern Canada through the western half of the U.S. and into Mexico). 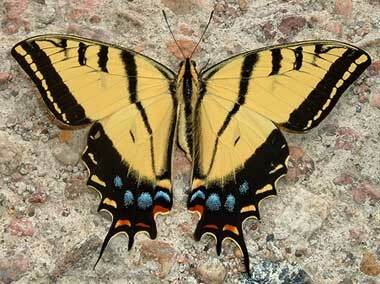 The adult butterfly has yellow to orange-yellow wings edged thickly with black. Each wing has 4 almost parallel stripes (the innermost stripe is the longest, while the outermost two may simply be bars). The hindmost part of each wing has a curved row of blue patches and below the blue are several bars or spots of orange. Two tails extend from the rear of the hind wing, with the innermost tail considerably shorter. 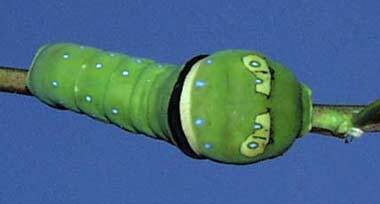 The caterpillar (larvae) of the two-tailed swallowtail butterfly is light green and marked near the head with four yellow dots and two yellowish eye spots with blue centers. The "neck" of the caterpillar is banded with black and yellow, and the body has several rows of tiny blue dots. The caterpillar turns brownish or reddish just prior to pupation. two-tailed swallowtail butterfly caterpillars feed on the leaves of a variety of trees and shrubs; adults drink flower nectar. 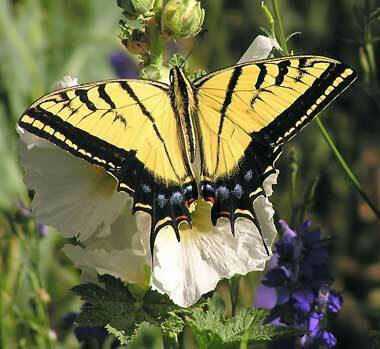 Two-tailed swallowtail butterfly; photo © Kenny Broberg on Flickr (used by permission). Two-tailed swallowtail butterfly larvae; photo © Bruce Walsh / Butterflies of Southeast Arizona (used by permission).